Professional Aquabike Our most popular the Professional grade AquaBike takes adjustability and interval training to new levels. For multiple resistance levels and adjustable positioning, this bike offers the maximum fitness experience. FEATURES: +HANDLEBARS & Saddle: Adjustable both vertically and horizontally - fore and aft. For correct body positioning and targeted work – out experience. Handlebars are also reversible for additional posture options necessary in rehabilitation. +PRO FLYWHEEL: Different than the EASYLINE bike, our Professional AquaBike offers an innovative four elements pedal flywheel with pin rotation and synthetic self -lubricated bearing. + RESISTANCE: Variable settings for three grades of resistance, in addition to natural acceleration resistance. +BASE: covered with double anti ski rubber protection for better floor adhesion. Adjustable for pool depth and to account for any sloping. Safe on all types of pool floors including ceramic tile, mosaic, and PVC. Professional AquaTreadmill COMBINING RESISTANCE AND INCLINE, THE HYDRORIDER® PROFESSIONAL AQUA TREADMILL PROVIDES MAXIMUM LOWER BODY BUILDING WITHOUT STRAIN OR PRESSURE. FEATURES: +INCLINE ADJUSTMENT: Different than the EasyLine aquatreadmill, the professional version provides three incline levels for improved strength training and sculpting. +HANDLEBARS: The professional version is built with full length handle bars, providing optimum and grip and making this mill great for circuit training programs like 'Run and Box' and Aqua-triathlon. +SHOCK-ABSORBING PLATFORM: innovatively developed with 308 individual rolls, rotating over flexible shock-absorbing support. +RESISTANCE: Active leg movements drive rolling momentum for additional strengthening and sculpting. +STORAGE: Compared with the Easyline version which is light and foldable, this is a more substantial piece of equipment mean for continued placement. This treadmill is great for fitness on the go or facilities that change out equipment regularly. Diamond AquaJump Produced with high quality materials. The AISI 316L Stainless Steel is paired with an innovative design specifically conceived for pool facilities. 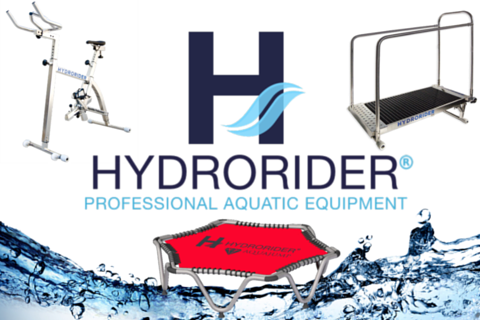 The HYDRORIDER DIAMOND AQUAJUMP allows you to enjoy the multiple benefits of water exercise combined with coordination training and fun! ADVANTAGES: + REDUCED STRESS + MUSCLE RELAXATION + BLOOD FLOW STIMULATION + WATER MASSAGING + STAMINA TRAINING + WEIGHT LOSS + BALANCE TRAINING + BODY TONING + PHYSICAL REHABILITATION PRODUCT FEATURES: + RELIABLE AND DURABLE + SUITABLE FOR CONTINUOUS DAILY USE + VULCANIZED RUBBER SUCTION CUPS ON BASES FOR ADHESION AND POOL FLOOR PROTECTION + EASY AND COMPACT STACKABILITY + LITTLE STORAGE SPACE NEEDED + SHOCK-RESISTANT RUBBER BUMPERS + LOW MAINTENANCE BASE: Frame shape provides superior stability and safety and is safe for use in all types of pools: ceramic, tiled, pvc etc. POOL DEPTH: Recommended at 3.5' to 4.5' (110 - 140 cm) INCLUDED: 2 year warranty on the stainless steel frame.